Use the INDEX PAGE. It has links to every page on the site !! More to come !!! Have you caught anything besides a cold ???!! Well send me the picture of it !!! Got any photos of your catches around the LB waters ?? Email them to me and show the world !!! 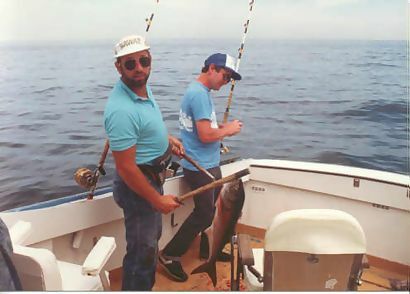 Long Beach has always been a great place for fishing. Admittedly, it may not be what it once was, but plenty of fish have been caught in it's waters. Prior to 1849, when the first Life Saving Service station was built, fishermen were the only residents. 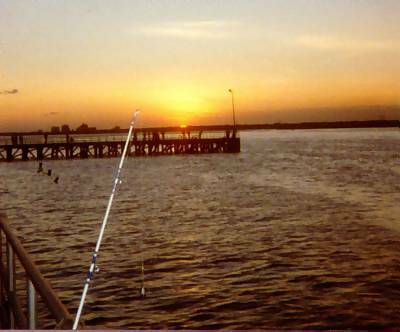 Although we never had a big fleet of party boats, save for the Commodore and a few others, plenty of boats from Point Lookout, Freeport and Captree fish the surrounding waters, so those photos are included here. Many of these were sent to me by Capt. Sam Schwarzman and Vinny Rossi, but I know there must be plenty more in your attics ! Email them to me !! Thanks ! WARNING !!! Some of these photos are bloody !! If the sight of blood bothers you, go no further !! You have been warned ! Capt. Sam at the helm of the Yankee out of Captree. Capt. Sam and his mate, Ronny Peters about 1982. The fish are mackerel. They caught over 1,500 that day !! When the fishing is this good, even the Captain cleans fish !! That's alot of blood for a little fish !!! Bet there were a hundred gulls following the Yankee on this day ! The Eleanor, Capt. Sam's boat, in her berth at Captree. On the dock at Captree. 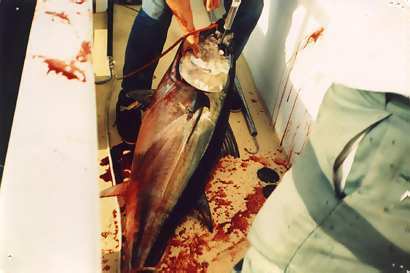 Yellowfin Tuna caught on the Atlantic out of Freeport. 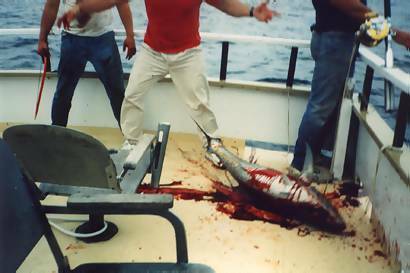 That's a customer with the white pants on..must have been his first tuna trip, nobody wears white to one of these blood baths !!! Tile fish in the Hudson Canyon. For many years no one fished 100 miles offshore at the canyon, which let these fish grow to great sizes. Fishing depths ranged from 600 to over 1000 ft.
A nice group of big Tile fish, some to over 75 lbs. Fishing depths over 600 ft, lead lines and sinkers of 16 oz. or more made electric reels like this one nice to have around !! 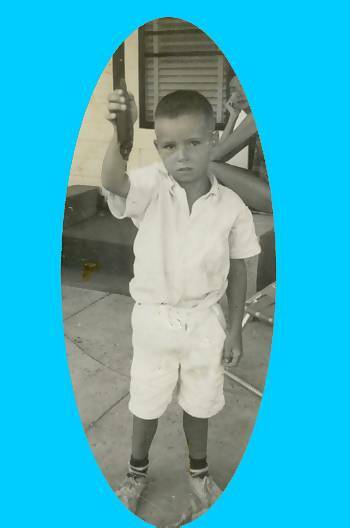 This is my brother, Jake, about 1964, with his first fish, a bergal. This was in front of our bungalow at 77 Arizona. He doesn't look too thrilled !! 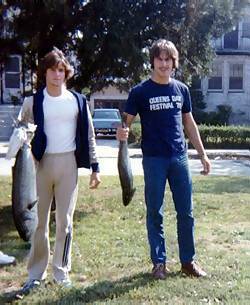 In fact, he never became much of a fisherman !! Vinny Rossi with a beautiful 40 lb. 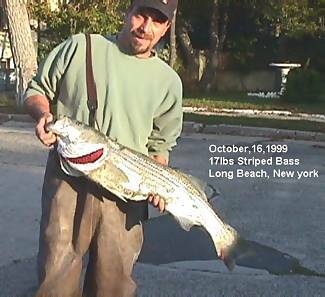 Striper caught at Laurelton Blvd. 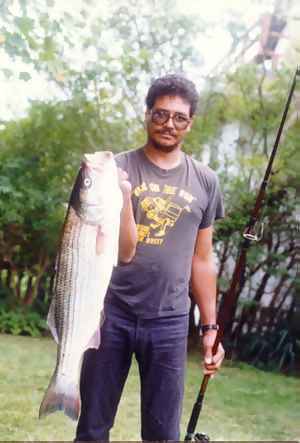 on clam bellies in Sept. 2000. 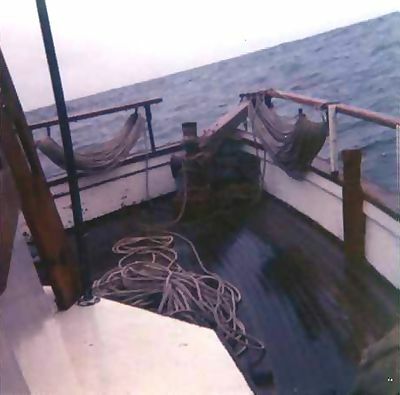 Winter trips to the Atlantic cod fishing grounds are not for the faint of heart or weak of stomach !! Grab your dramamine and hang on !! 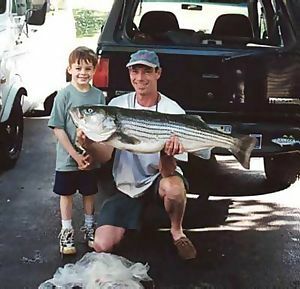 Eddie Gennusa with a 17 pounder caught at the beach. 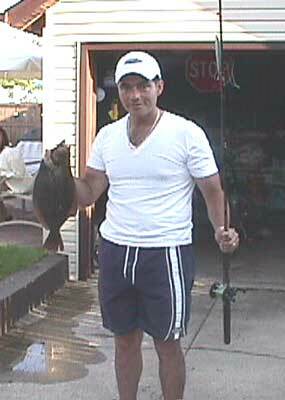 Vinny Rossi with a 16 lb. Striper. Steve Bobkin teaching a toothy bluefish some manners !! 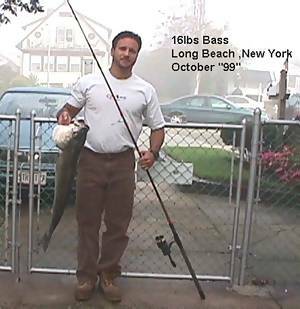 Mario Hernandez with a 15lbs bass caught in the surf at Laurelton Blvd. Mario Hernandez again. 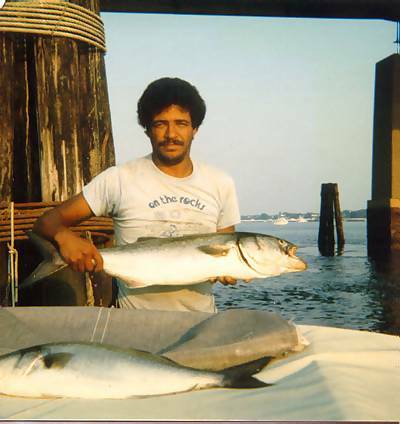 2 bluefish caught at magnolia pier Sept "85"
Looking west from Magnolia pier at sunset. Tito Ventura with a 12lbs Blue caught at Magnolia pier. Mario Hernandez with an 8lb Fluke caught at Lindell Blvd Reynolds channel. Summer "2000"
Which way is up ??!! Try and keep the horizon lined up on this day aboard the Blue Albatross with Capt. Sam !! 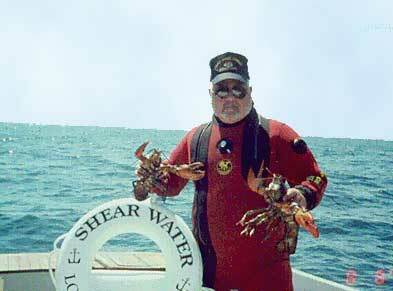 Mike Voges, LBHS class of 1964, with dinner for two on the SHEAR WATER, south of Long Beach. The photo was taken August of 1999. The lobsters were broiled and served with melted butter that evening. 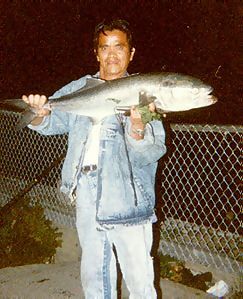 Gil Santiago with a nice fluke caught at Magnolia pier in June 2001. 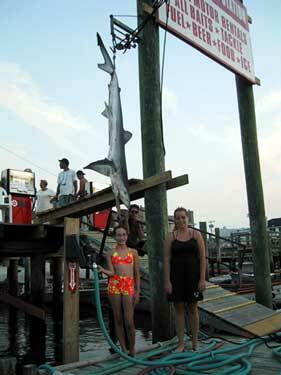 Tara and Kristina Perry on Long Beach with a nice 110 lb Blue Shark caught on 6/27/01. Send me your scans if you have some nice catches ! !